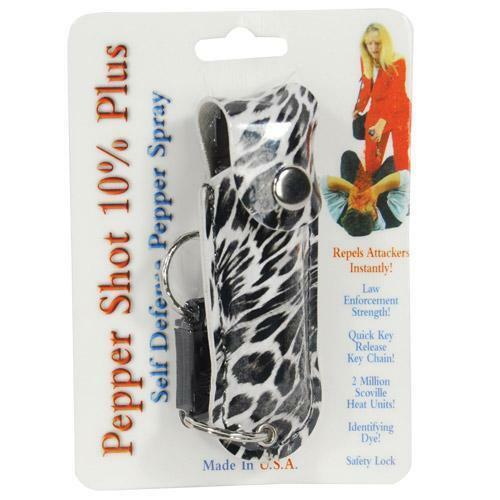 PEPPER SHOT® PEPPER SPRAY is a 10% pepper spray rated at 2 million Scoville Heat Units and made with a very fine grain that is more effective than the coarser grains of most other pepper sprays. In addition to causing an attacker pain, Pepper Shot swells the mucous membranes, which makes breathing difficult, and swells the veins in the eyes, causing the eyes to close. These effects can last up to 45 minutes and cause no permanent damage. All models have a locking actuator except for the Pepper Pen. Effective upto 8 feet. Contains 5 one second bursts.